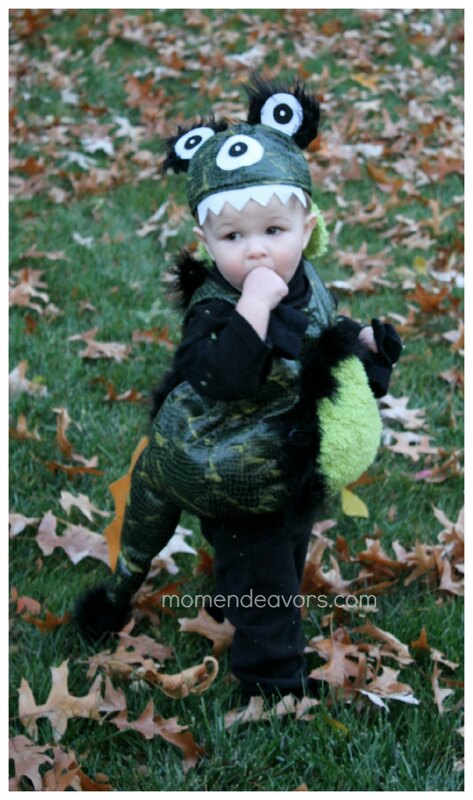 It was another year of family-themed cos­tumes for Halloween! 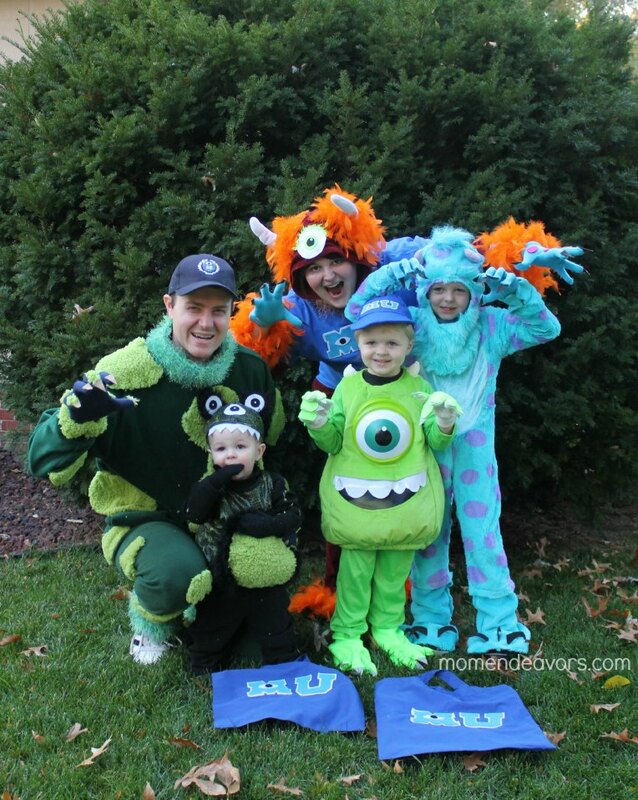 Ever since seeing Monsters University this past summer, I knew it would be such a great family theme. So, we were already doing some monsters costume planning over the summer. 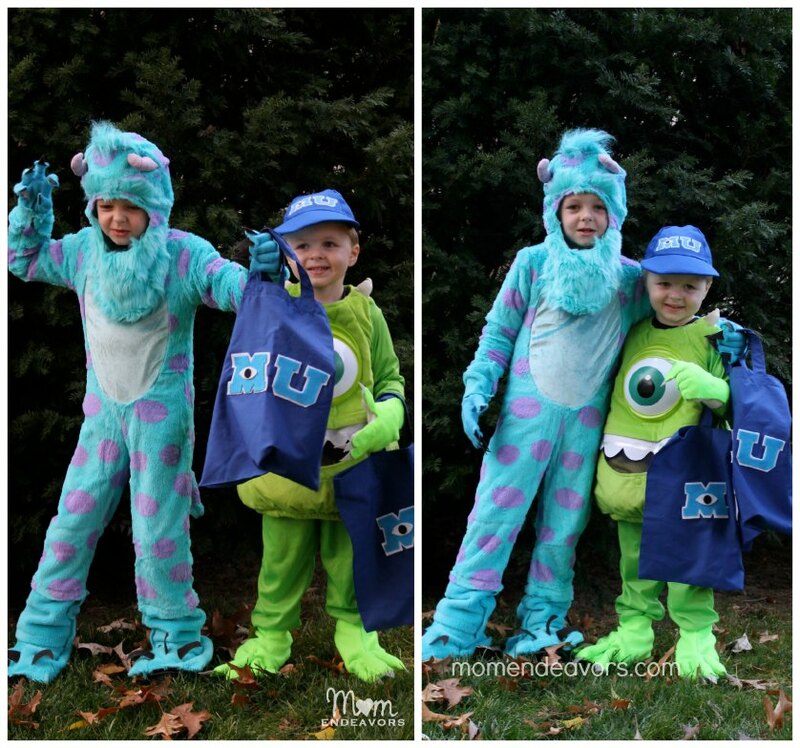 Originally, I had thought about making the Mike & Sulley costumes in DIY style. But, with all of our medical crises the past couple months, that was just too much. 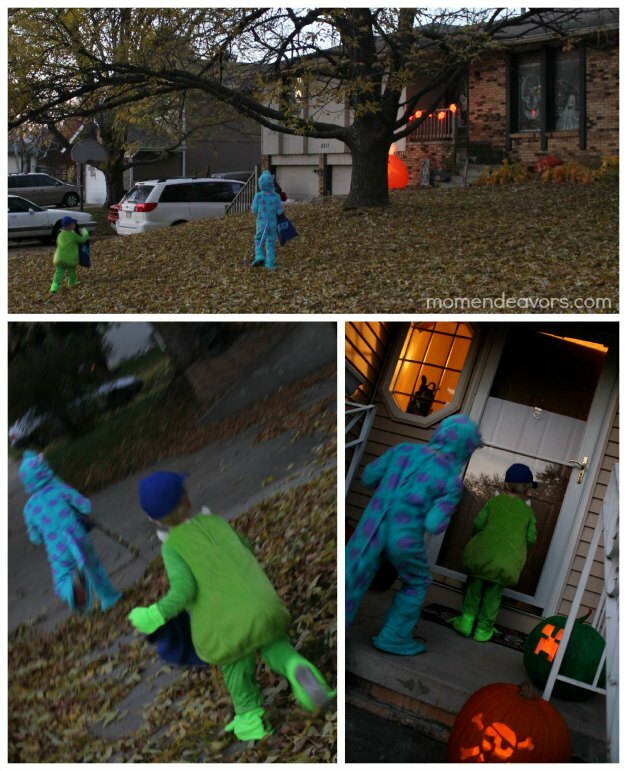 So, we bought the Mike & Sulley costumes and that’s ok with me as the boys absolutely LOVED their costumes! And, I love these pictures! So cute! We actually did do some DIY tweaks to the costumes. Big Brother’s Sulley costume was just a bit too small, so we added some turquoise fleecey fabric to the bottom of the legs. And, for both boys we made monster hands, feet (shoe covers), and MU trick-or-treat bags! The rest of our costumes were put together with some random items found at Goodwill and then “monsterfied” in DIY fashion (I’ll share a bit more in an upcoming post on how we did the costumes). 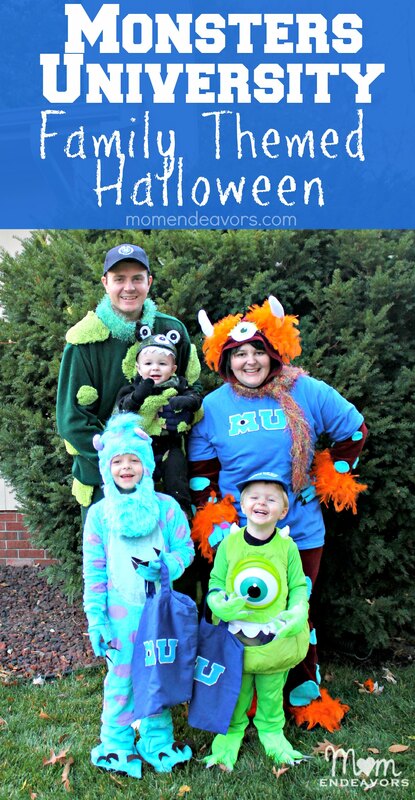 Then, we got on our best Monsters University top scarer faces and headed out for some Halloween fun. Baby Brother sure looked cute too as the littlest Monsters University scarer. His little tail waddled when he walked in just the cutest way…and he makes the funniest growling sound right now that was priceless! It was such a gorgeous night! This was our first time spending Halloween back in the Midwest and it was great to experience something different. The crisp fall air and all the leaves made it feel like the quintessential Halloween experience. What did your kids/family dress up as this year? For more Monsters University fun, be sure to check out this post with over 35 Monsters fun foods & crafts! And, for more Disney-inspired costume ideas, head over to this post with over 20 great costumes. We had a Sully in the family, too. And just as adorable as yours. 🙂 His older brother was a skeleton. Named Bones! Great idea! Turned out super cute! OMG, these pictures are just toooooo cute!!!! Fantastic! I love that you were still able to use the Sulley costume by adding the fleece! I had to look really close to even see it! Great Job!